We offer 4 x 4 Toyota safari land cruisers for hire in Kenya and Tanzania that come with an experienced safari driver/guide to our individual or corporate clients. 4x4 Toyota safari Jeeps can withstand all road terrain. and have sliding windows for sightseeing and top hatch for easy game viewing. We have the capability and expertise in handling all your very specific ground transport requirements from a small group of family to a large group whilst offering an exciting opportunity for exploration, discovery and adventure. We use them for various African adventure holidays and photographic safaris in Kenya and Tanzania . Whatever your requirement, you can be sure that our Safari Land Cruiser will be the perfect choice for you. The 4×4 Kenya & Tanzania safari vehicles have a unique suspension system and open-sided, tiered seating arrangement, specially-designed to maximize your comfort and game viewing opportunities in Masai Mara, Amboseli,Serengeti,Ngorongoro. The 4×4 Safari Landcruiser is Kenya’s best Safari vehicle , offering improved comfort and better versatility, allowing tourists to access Safari camps and lodges which may have challenging road conditions. Our Jeep Safari vehicle comes fitted with UHF Radio Call, game viewing hatches and additional safari customization such as cooler boxes to carry drinks. Comfortable reclining seats.Load compensating suspension for a smooth ride on rough roads. The Safari Land cruiser for rental has double spare wheels and 5 doors for easy access. The front seats the driver and one passenger. 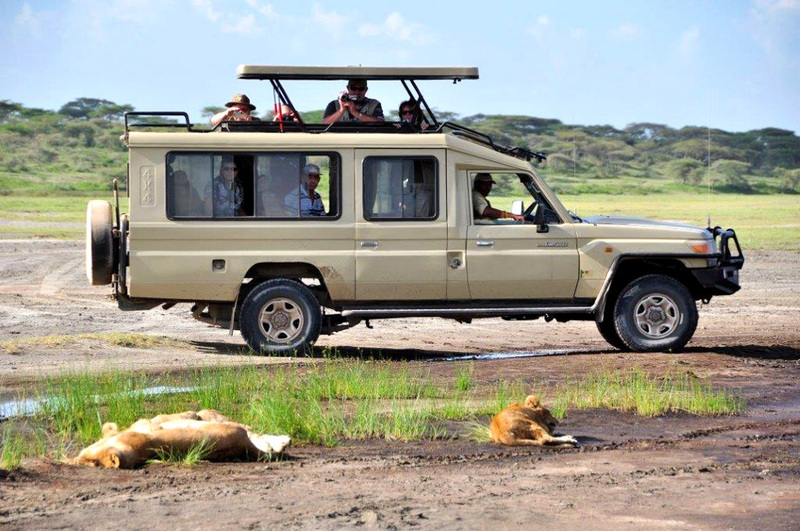 The safari land cruiser has an open roof for sightseeing and photography. 4X4 Safari Land Cruisers for Hire in Kenya and Tanzania cannot be better found affordably anywhere apart from Roaming Africa Tours and Safaris. With a pop up roof, Air conditioning, comfortable seats equipped with seat belts and Clear Windows, the Luxury Safari Land cruisers are indeed part of the lasting Africa Safari experience. Our four by four safari jeeps for travel in Kenya and Tanzania are specially designed and customized for comfort,best game viewing and photography. We also offer Accessible Safaris Jeeps to cater for the safari for physically challenged and disabled persons that come with specially designed wheelchair access ramps . An extra strap belt can be arranged for those passengers in the wheelchair to ensure more stability and safety while driving. Our (six) 6-seater safari jeeps are built to the same exacting specifications as their larger 8 Seater counterparts, and offer the same excellent all-round viewing with a window seat for each guest and a full-size photo roof hatch. That means that when the animals pop up, so can the guests – cue outstanding wildlife images all round. Each vehicle is regularly serviced, and equipped with water, field guides for creature identification and a first-aid kit. Not to mention an expert local guide! Our safari driver-guides who are extensively trained, qualified and experienced. Their knowledge spans over virtually everything you will encounter on safari – the wildlife, flora and fauna, the birdlife, the people and the local culture. Each driver-guide undergoes a rigorous and mandatory training program. NB: All vehicles are chauffeur driven, by our uniformed and trained safari driver-guides. We do not offer self-drive 4×4 safari vehicles. All our cars are compliant to the transport act and have all the stipulated licenses and registrations that they may require.